No post bumping is allowed. Post bumping is replying to a post over and over again simply to move the posts position to the top of a forum. For information on how our message board system work, click here. You are allowed to sell/share any physical study guides that you have legally purchased in our GMAT Books for Sale/Donation forum. However, you are NOT allowed to sell online class access or electronic files. We do NOT allow for the sale or transfer of single-user licensed materials on our site. Don’t come to our site to market your products or services. We’ll delete these posts if you do (and ban you). Your primary role is to serve as a teacher/advisor/expert for the community—not a pure marketer. Community members will respect you more if you produce lots of quality content rather than attempting to directly market services. Please do not spam us! Identify Yourself! Please include the company you work for and your position in your signature and/or username. Signing Off. Please limit your signature to a maximum of 2 URLs – More than 2 URLs could result in disciplinary action. Put a face to your name! Upload a profile picture or a company logo to match your username. Or, complete this form and we’ll get in touch with you! Just use your common sense and you’ll be fine! Check the validity of user reviews. The facts and opinions of user reviews will be left up to the community to evaluate. 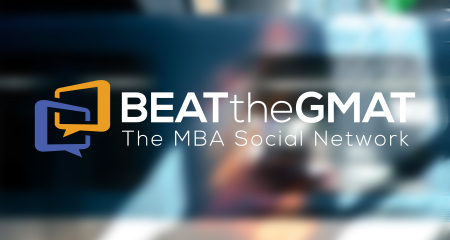 Only BTG verified reviews should be considered the opinion or responsibility of Beat The GMAT. We will NOT investigate the validity of user profiles. We trust our users to represent themselves truthfully and transparently. Issues concerning the identity of a user should be resolved off-site. We will only intervene in user disputes if evidence is provided that a user is acting against the guidelines or rules outlined above. We will NOT investigate one user on behalf of another without substantial evidence.